Hazards are produced by business operations, to be sure, but they are defined and evaluated socially-in the mass media, in the experts' debate, in the jungle of interpretations and jurisdictions, in courts or with strategic-intellectual dodges, in a milieu of contexts. As mirror and conscience of society, sociology must define, promote, and inform public debate about deepening class and racial inequalities, new gender regimes, environmental degradation, market fundamentalism, state and non-state violence. I believe that the world needs public sociology-a sociology that transcends the academy-more than ever. Our potential publics are multiple, ranging from media audiences to policy makers, from silenced minorities to social movements. They are local, global, and national. During the summer of 2008, community members in Richmond, California, filed out of a packed and raucous city council meeting after being handed a major setback. Despite Herculean organizing efforts and passionate testimony by fence-line neighbors, council members had voted to approve a conditional-use permit allowing the Chevron oil refinery to increase its production capacity by refining lower-grade crude oil with a higher sulfur content, resulting in increased emissions of harmful sulfur dioxide, sulfates, and metals (Jones 2008; Baker 2007). The Richmond Chevron refinery is one of the nation's largest, covering 2,900 acres, employing a thousand workers, and processing more than 240,000 barrels of crude oil daily into gasoline, jet fuel, diesel, and lubricants (Chevron Corporation 2009a, 2009b). At the meeting, community members presented scientific data from an NIH-funded household exposure study conducted collaboratively by an independent research institute, two major universities, and a regional environmental justice organization. The data showed that refinery activities were adversely affecting indoor and outdoor air quality and that the refinery should reduce emissions, not increase them. After the meeting, one of the scientists spoke with a community organizer about whether science could play a productive role in localized, high-stakes policy decisions such as the one that had just unfolded. The organizer's assessment illuminates the potential, the limitations, and the contested role of science in struggles for environmental health and justice: "Science has its limitations, but it develops strong advocates-people can speak for themselves. The data generated supports the claims, experiences, and demands that the community members bring to the podium in policy settings. Community members can say, 'I know this because my home was tested and all these chemicals were found in my house!'" As decisions about social policy and environmental regulation in the United States, are increasingly shaped by scientific and technocratic discourse, some communities and most industry stakeholders have used their own data and challenged scientific evidence to advance their interests. Yet the insistence on "better" science in decision making often reinforces dominant political and socioeconomic systems by slowing down policy making, precluding precautionary action, and ensuring regulatory paralysis through (over)analysis. Through this scientization of decision making, debates regarding the costs, benefits, and potential health and societal risks of new technologies and industrial production may be dominated by experts who work to ensure that battles over policy remain "objective" and divorced from their socioeconomic and political contexts. This outcome is achieved in three ways. First, questions are posed in scientific terms that may be impossible to answer scientifically, because of uncertainties in the data or the impracticality of carrying out a study. Second, political and moral questions are inappropriately framed in scientific terms, thereby limiting public participation (Weinberg 1972). Third, the scientization of decision making delegitimizes those questions that may not be amenable to scientific analysis. For example, racial, class, and transgenerational inequalities in environmental hazard exposures have been largely downplayed or ignored in the regulatory arena. All of these processes exclude the public from important policy debates and diminish public capacity to participate in the production of scientific knowledge itself. Scientization is closely related to the perennial debate over what counts as science and what lies outside the scientific realm. This boundary is highly contested, because different actors struggle over the resources and authority associated with science. Scientists and nonscientists alike engage in what sociologists call boundary work, the active construction and contestation of the legitimacy, authority, and resources associated with the scientific enterprise (Gieryn 1983, 1999). From this boundary-work perspective, debates over scientific authority in policy making result from efforts by scientists to expand and legitimize their authority and by policy makers to use scientific authority to justify their regulatory decisions. These types of boundary work can exclude public voices from the decision-making process. For nearly four decades, a class of social movements known as health social movements (HSMs) has challenged political power and scientific and professional authority. Examples include struggles to improve the quality of and access to health care (e.g., health insurance reform and advocacy of a single-payer health system); to eliminate persistent health inequalities based on race, ethnicity, gender, class, or sexuality (e.g., the women's health movement); and to push public health and medical institutions to address fundamental causes of disease and disability by reshaping scientific inquiry on etiology, diagnosis, treatment, and prevention (e.g., the HIV/AIDS and breast cancer movements). Historically, the emergence of HSMs focused on contested illnesses has involved scientific disputes and extensive public debates over the definition, causes, treatment, and prevention of disease. Among these, HIV/AIDS, breast cancer, and asthma HSMs have been central to promoting social and policy change; breaking new paths of scientific inquiry; and bringing attention to the politics of public health and prevention in the United States (Epstein 1996; Ferguson and Kasper 2000; Brown et al. 2004; Corburn 2005; Morello-Frosch et al. 2006). Indeed, HSMs have demonstrated that scientific knowledge is "coproduced" as government, industry, community advocates, and academic researchers all generate different forms of expert knowledge and scientific data that drive regulatory science and influence all parties (Jasanoff 2005). Furthermore, contested illness struggles highlight how regulatory science integrates scientific data and analysis with "large doses of social and political judgment" because the issues involve scientific uncertainty and contestation (Jasanoff 1990, 229; Jasanoff 1987). In short, health social movements shape and reshape science, and science in turn shapes and reshapes health social movements. Despite the existence of a significant body of research on health social movements, the field of contested illnesses is still in its infancy. Methods for studying HSMs tend to be limited to deep ethnographic case studies of single movements or organizations. Only recently have scholars begun to examine more deeply the forces that give rise to HSMs and cross-movement coalitions focused on contested illnesses and policy goals. Moreover, little attention has been given to the collective influence that HSMs have had on scientific fact-making in public health, public policy, and regulation. 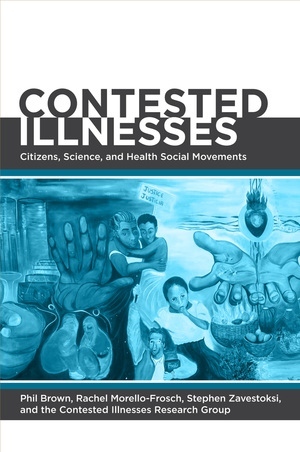 This book addresses these gaps by discussing interdisciplinary research conducted by the Contested Illnesses Research Group (CIRG) on how contested illness struggles play out in three realms: the collective illness experience and movement building; scientific fact-making in public health and medical science; and policy making and regulation. We argue that the social movements emerging from contested illnesses have been catalyzed by three social forces: growing public awareness about the limited ability of medical science to solve persistent health problems that are socially and economically mediated, the rise of bioethical dilemmas in scientific knowledge production, and the collective drive to enhance democratic participation in the scientific enterprise. By using science to democratize knowledge production, contested illness struggles engage in effective policy advocacy, challenge aspects of the political economy, and transform traditional assumptions and scientific lines of inquiry regarding disease causation and prevention. Recent contested-illness struggles have moved into the realms of environmental and ecological health, as mounting scientific evidence has linked environmental and human well-being (Colborn, Dumanoski, and Myers 1996; Schettler et al. 1999). Disturbing trends in human health statistics, such as declining sperm counts, rising rates of fertility problems in young women, and increasing rates of breast, testicular, and prostate cancers suggest environmental causes (Schwartz and Woodruff 2008). The prevalence of asthma and certain neurological problems in children also appear to be on the rise (Beasley et al. 2000; Gurney et al. 2003; Newschaffer et al. 2005; Holguin 2008). Although environmental links to human disease remain hotly contested, scientific evidence strongly suggests that increasing and ubiquitous chemical exposure where we live, work, and play may partially explain these trends (Schettler et al. 1999; Landrigan et al. 2002; Grandjean and Landrigan 2006; Wilson and Schwarzman 2009). Since World War II, chemical production in the United States has increased more than twentyfold. "In 2006, more than 34 million metric tons of chemical substances were produced in, or imported into, the United States each day" (Schwarzman and Wilson 2009, 1065), and the number of chemicals registered for commercial use in the United States has increased by more than 30 percent since 1979 (Schwartz and Woodruff 2008). Many of these chemicals are showing up in our air, water, food, ecosystems, and body tissues (Morello-Frosch et al. 2009a). For nearly a decade, the CIRG has focused on social movements dealing with environmental health. Its members represent the disciplines of environmental and medical sociology, science studies, environmental health science, epidemiology, and medical and environmental anthropology. (For details on the CIRG's history, see Senier et al. 2006.) With support from the National Science Foundation and the Robert Wood Johnson Foundation, the CIRG initially sought to address the lack of knowledge on health social movements related to contested illnesses and to improve understanding about the role of these struggles in reshaping scientific inquiry and pushing for policy change. Our first case studies entailed disease controversies with potential environmental links, including asthma, breast cancer, and Gulf War illness. Our work centered on understanding stakeholder struggles related to the underlying causes of these diseases-including, in the case of Gulf War syndrome, disputes over whether the veterans' physical and mental symptoms were real. Over time our analytical gaze has broadened to examine contested illnesses in domestic and global contexts and specific controversies related to medical and environmental health science, the politics of public health prevention, and regulatory decision making. This shift has required us to expand the scope of the health social movements that we examine and rethink our ethnographic methods for studying these struggles. CIRG has moved beyond studying scientific controversies to engaging directly in the environmental health and science enterprise using community-based participatory research (CBPR). One key premise of CBPR is that involving the communities that experience hazardous exposures and diseases can promote new lines of inquiry and analytical techniques. Further, CBPR allows substantive community participation in the research process, including formulating research questions, collecting data, and disseminating results to diverse constituencies and the scientific community (Israel et al. 1998; Minkler and Wallerstein 2003). In pursuit of this objective, CIRG began to strengthen the links between its ethnographic and scientific work and the environmental policy and regulatory goals of its community collaborators. By collaborating with organizations that contest traditional approaches to regulatory science and environmental health policy making, we positioned ourselves to explore scientific, ethical, and political challenges in three realms: doing science, interpreting science, and acting on science. Doing science involves assessing how scientists (and sometimes their community collaborators) choose research topics, conduct research, collect data, and manage their relations with funding institutions and support organizations. It also incorporates the study of how government and nongovernment organizations shape the funding and directions of scientific inquiry. Interpreting science involves examining the ways scientists make sense of data, assess how study results fit with existing bodies of knowledge, and develop qualitative and quantitative criteria for standards of proof. Acting on science relates to advocacy and organizing; it also encompasses the dissemination of new scientific results through peer review, the media, government agencies, and the general public in order to gain the support of scientific colleagues and decision makers to improve policy making. This triad model uncovers complex paradigm shifts in scientific and community knowledge production by integrating community and expert knowledge and qualitative and quantitative methods (Brown et al. 2006). CIRG's decision to collaborate on scientific work and policy advocacy with some of the groups we were studying may seem unconventional. Yet this form of public engagement has deep roots in both public health (Gottlieb 2005; Corburn 2007) and sociology (ASA 2005). CIRG's transition from observer to participant-observer has enabled us to examine contested illnesses by assessing the effectiveness of different scientific methods for answering regulatory and policy questions (e.g., assessment and reduction of exposure to pollutants versus epidemiologic studies searching for definitive links between pollution and disease). We also moved from observer to participant status by engaging in the politics of regulatory science with diverse constituencies at multiple sites (e.g., sites of industrial production, sites of household product consumption, and sites of chemical persistence in environmental justice communities) (Altman 2008). Our collaboration on a scientific project with community organizations was initially motivated by our study of the environmental breast cancer movements in Massachusetts and the San Francisco Bay Area and our long-term collaborative relationships with environmental justice advocates in California. This CBPR project entailed a partnership among three entities: CIRG; Silent Spring Institute, a research institute that examines links between women's health and the environment; and Communities for a Better Environment (CBE), an organization that combines science, litigation, policy advocacy, and community organizing to address environmental justice in California. With funding from the National Institute of Environmental Health Sciences (NIEHS) Environmental Justice Grants Program, our collaborative launched the Northern California Household Exposure Study in neighborhoods bordering an oil refinery and major transportation corridors in Richmond and in a comparison community, Bolinas, in rural Marin County. The project brought together the breast cancer advocacy and environmental justice communities by conducting a household exposure study that measured endocrine-disrupting compounds (EDCs) and other contaminants in household dust, indoor air, and outdoor air. The chemicals of interest to environmental justice advocates included urban air pollutants, industrial chemicals, and pesticides to which low-income minority populations are disproportionately exposed (Morello-Frosch and Shenassa 2006). Some of these compounds have also been linked to asthma, premature puberty, obesity, and cognitive development problems (Gold et al. 2005; Carpenter 2008; Holguin 2008). EDCs from sources ranging from consumer products to industrial processes are also a central concern for breast cancer activists, because many EDCs mimic the human hormone estrogen, a known risk factor for breast cancer (Brody et al. 2007b; Rudel et al. 2007). EDCs are also emerging as a health equity concern because of the disproportionately high breast cancer mortality among African American and poor women (still largely unexplained), as well as rising rates of breast cancer among some immigrant groups (Deapen et al. 2002; American Cancer Society 2007; Baquet et al. 2008). Both breast cancer and environmental justice advocates have sought to reshape scientific approaches in ways that highlight potential causes of disease and suggest opportunities to reduce chemical exposures and safeguard community health. Our group chose to conduct an exposure study, because an epidemiologic breast cancer study within Richmond would not have been informative given the community's small size and the lack of data on relevant historical chemical exposures (Brody et al. 2009). An exposure study of potentially hazardous compounds can assess the extent of a pollution problem and inform action to reduce exposures. Moreover, exposure studies are not as resource-intensive and are more conducive to an academic and community partnership incorporating collaborative design of study protocols, data interpretation, and dissemination of results. To decide how to collect data that would advance the shared goals of the three project partners, we conducted a year-long deliberative process. This entailed gathering information on community health concerns through community meetings; building on CBE's relationships with public officials in Richmond to gain support for our work; and convening an advisory council of neighborhood activists, breast cancer and biomonitoring activists, a state health official, an environmental justice advocate, and an outside academic researcher. Using the results of this input, we designed research to assess the cumulative exposures and specific sources of indoor pollution originating from outdoor industrial emissions, transportation sources, and consumer products. CBE staff were equipped and trained to conduct interviews and collect air and dust samples that were subsequently analyzed for industrial and traffic-related pollutants, such as particulates, metals, polycyclic aromatic hydrocarbons (PAHs), ammonia, and sulfates, and also for compounds found in consumer products, such as pesticides, flame retardants, phthalates, and phenols. CIRG's experience with the Northern California Household Exposure Study demonstrates how joint community and academic production of environmental health science can enhance the rigor, relevance, and reach of scientific research projects. The scientific rigor of the study was ensured through collective discussion and negotiation of study design issues such as choosing study sites, recruiting study participants, finalizing the list of chemicals for analysis, and developing protocols for reporting study results. For example, CBE encouraged the study team to collect a subset of air and dust samples from a community that did not have significant outdoor industrial and transportation source emissions, so that these results could be compared to those from Richmond. As a result, we added Bolinas as a comparison site. Similarly, the relevance of the study was bolstered through the development of bilingual (Spanish and English) graphic displays to communicate aggregate and individual sampling results for dissemination to individuals and at community meetings. This effort helped to ensure that study results were transparent and scientifically valid, conveyed uncertainties, and elucidated strategies for exposure reduction. Finally, CBE's engagement in the study helped us to reach broader audiences and thus apply scientific results to making better decisions about land use. For example, scientists and CBE trained community residents to effectively present scientific data at community meetings and to testify before regulatory and policy forums. Our experience with the Household Exposure Study and other CBPR projects has taught us that collaborative enterprises encourage all partners to consider the political and moral contexts that shape how we do, interpret, and act on science. As this book demonstrates, linking environmental health research with organizing and policy applications not only improves the scientific enterprise but also ensures that diverse groups can use good science to protect community health, push for innovation in scientific methods, and forge new paths of inquiry. This book is organized into three parts. Part 1 provides a theoretical framework and overview of CIRG's methods for examining contested illnesses. Part 2 presents several scientific and ethnographic case studies that represent the trajectory of CIRG's work. Part 3 explores policy applications of this work. Chapter 2 revisits and updates some of CIRG's early theoretical work on embodied health movements (EHMs). EHMs are a relatively new subset of health social movements that challenge science and medicine on all aspects of contested illnesses. They introduce the biological body into social movements in compelling ways, using the embodied experience of illness to counter the authority of established institutional actors. In this way, EHMs elucidate the political economy of health and disease to shift intervention strategies upstream, beyond treatment and toward prevention. Very often, EHMs simultaneously challenge and collaborate with researchers and health professionals to pursue new paths of inquiry about the fundamental causes of disease, including social and environmental factors. These activities lead to a shift in what we term the dominant epidemiological paradigm (DEP) of disease causation. Chapter 3 grounds our current work by examining qualitative methods used by various environmental health scholars. It further addresses issues of reflexivity: the researcher's impact on the field and the field's impact on the researcher. Chapter 3 demonstrates that qualitative methods are important instruments that allow community narratives to be constructed and shared. Furthermore, they provide social scientists with an opportunity to contribute to community activism and advocacy. Chapter 4 proposes a new approach to the ethnography of contested illnesses that is multisited and focused on policy. Our field-analysis method situates social movements within social and institutional worlds that include diverse allies and coalition partners, some with conflicting perspectives. These may include government, academic, scientific, and civic organizations. What we call policy ethnography employs field analysis as one analytical tool. It explores the spaces and boundaries between science, policy, and civil society. Specifically, policy ethnography combines traditional interviews, content analysis (of government and organizational documents and media), and participant observation with historical analysis of movement trajectories, evaluation of current policy strategies, assessment of political contexts and opportunities, and the evaluation and use of scientific evidence. Most important, policy ethnography assumes a policy goal. In some cases, those carrying out policy ethnography are themselves actors in the policy realm. In part 2, chapter 5 discusses a scientific analysis conducted by the Southern California Environmental Justice Collaborative. This community-based participatory research project, focusing on environmental health in Los Angeles schools, used secondary data analysis to answer scientific questions that informed policy advocacy and the organizing strategies of community partners. The chapter presents quantitative results from the analysis on environmental inequality in exposure to ambient-air toxics and associated health risks among schoolchildren. It examines the implications of this work for regional and state policy and the possibility of better application of the precautionary principle to issues of environmental justice. Chapter 6 revisits and updates our analysis of the contested terrain of Gulf War illnesses. We examine the dramatic shifts in scientific and public controversies over myriad symptoms reported by veterans of the 1991 Gulf War. We begin by describing illness associated with the Gulf War, the sources of conflict, and the scientific complexity of its definition and etiology. We initially expected to find strong evidence for environmental links to this collection of debilitating symptoms and conditions but found a lack of scientific data supporting that perspective. Indeed, early theories of Gulf War illnesses centered on stress as the dominant cause. The dominant epidemiological paradigm now attributes the illness to contextual stress as well as chemical exposure. This paradigm shift culminated in a recent federal report concluding that "scientific evidence leaves no question that Gulf War Illness is a real condition with real causes and serious consequences for affected veterans" (RAC 2008, 5). Chapter 7 updates our earlier examination of the politics and embodied health movement strategies of environmental justice advocates working on asthma issues: Alternatives for Community and Environment (ACE), based in the Roxbury area of Boston, and West Harlem Environmental Action (WE ACT), based in New York City. Here we demonstrate how asthma is transformed from a disease affecting an individual to a politicized collective illness experience. Community-based environmental justice organizations link asthma with the social determinants of their health, such as discrimination and social inequality. Chapter 8 examines Cape Cod residents' discovery of and response to pollution exposures inside their homes and bodies. This chapter shifts the focus to embodied experiences other than the manifestation of potential disease and symptoms. We demonstrate that science-not just the direct experience of environmental problems-shapes participants' embodied health experiences. Until recently, most work on environmental pollution has focused on measuring chemicals in air, water, and soil. However, advances in exposure assessment science have led to the analysis of more intimate spaces in people's homes and body tissues. This chapter highlights how science influences people's discovery and understanding of environmental health threats. It suggests future opportunities for social scientists to expand their examination of contested illnesses by characterizing how exposure experiences vary and are mediated by environmental science. Chapter 9 revisits our earlier investigations of the environmental breast cancer movement (EBCM) in Massachusetts; Long Island, New York; and the San Francisco Bay Area. Our research began with an in-depth study of one organization dealing with environmental links to breast cancer: Silent Spring Institute in Massachusetts. However, it soon became apparent that there was a broader environmental breast cancer movement that was directly challenging the traditional medical focus on individual-level factors associated with disease (e.g., diet, physical activity, and genetics) and advancing a new epidemiological paradigm centered on environmental causes. We describe the framework, history, and strategies of the environmental breast cancer movement, demonstrating the importance of understanding the fluidity of social-movement actors and allowing us to develop the concept of a "boundary movement." Boundary movements straddle the scientific and nonscientific realms, blur distinctions between laypeople and experts, and connect activist groups with nonactivist reform agents like public health officials. These movement sometimes employ "boundary objects" that have different meanings for diverse parties: for example, an air-quality monitor may represent an official data-gathering device for a government agency but a triumph of organizing success for a community group. In part 3, chapters 10 and 11 provide two case studies that investigate the potential and pitfalls of cross-movement coalitions between labor advocates and environmentalists. Scholars have written extensively about cases in which such "blue-green" coalitions have overcome class tensions that seemingly force workers to choose between job security and occupational or environmental health. Our first case study (in chapter 10) examines a successful coalition that worked to replace potentially hazardous cleaning products used in Boston public schools with safer alternatives. This coalition succeeded in part through the role of bridge builders who, through application of the precautionary principle, were able to unify community and environmental health advocates, labor activists, labor unionists, and school administrators to eliminate the use of toxic chemicals. Chapter 11 examines another labor and environmental health coalition, the New Jersey Work Environment Council. Again, a strategic cross-movement frame emphasizing environmental health and human rights helped the coalition achieve its goal of establishing reporting requirements for industry chemical use. Its campaign culminated in the passage of the most sweeping right-to-know laws in the United States. However, this cross-movement coalition experienced significant political challenges when some members attempted to expand the discursive frame and policy goals from the right to know to the right to act. Chapter 12 discusses a case study of the Brown University Superfund Research Program, in which academic researchers and state agency personnel collaborated with community activists in developing legislation to give temporary financial relief to residents of a contaminated neighborhood while they awaited cleanup. Relationships between stakeholders in cases involving contaminated sites are often contentious, in part because biomedical and engineering scientists are not trained to recognize and address the social problems that accompany the environmental hazards. By creating opportunities for cooperation, outreach efforts that make the research results more accessible can begin to repair trust among stakeholders and thus may pave the way for speedier site cleanup and reuse. This case study also shows how the inclusion of social scientists in a research translation and outreach program can contribute to a broader understanding of the social and political contexts that shape interactions between professionals and affected communities. Chapter 13 explores the ethical and scientific challenges of communicating results to communities and study participants in biomonitoring studies, which measure the presence and concentrations of chemicals and their metabolites in human tissues. Technological advances have made biomonitoring studies more common, but often scientists are faced with dilemmas regarding whether and how to report results to participants when the health implications of chemical exposures are not well understood. We identify three frameworks for reporting such data: traditional clinical ethics; community-based participatory research; and citizen science "data judo." The first approach emphasizes reporting results only when the health significance of exposures is known, whereas the latter two represent new communication strategies in which study participants are engaged in interpreting, disseminating, and applying results to promote community health. We then suggest five critical considerations for planning future biomonitoring studies. Chapter 14 delineates the challenges of obtaining institutional review board (IRB) coverage for community-based participatory research (CBPR) projects. This discussion draws on our experiences guiding a multipartner CBPR project through university and state IRB deliberations as well as on other CBPR colleagues' accounts. In general, IRBs are unfamiliar with this approach to research, reluctant to take responsibility for the actions of community partner organizations, and resistant to interaction between researchers and participants. Their hesitation causes significant delays and may prevent effective research and dissemination of results. We suggest concrete ways in which IRBs and funders can develop clear review guidelines that respect the unique qualities of CBPR. Chapter 15 discusses the implications of our work for further scholarship on health social movements. We draw conclusions about the need for future research, interdisciplinary training of undergraduate and graduate students, and funding opportunities to support community-based collaborative enterprises that reshape science and policy making. Finally, we direct readers to appendixes of supplementary material for research groups working in the fields of environmental health, CBPR, and health social movements. These appendixes, which are accessible online, include questionnaires and coding sheets to illustrate our approach to interviewing, along with meeting observations and literature and document reviews. We also provide a template for reporting exposure assessment results to diverse public audiences, incorporating both text and graphics. These materials can be used to address issues of results communication, research ethics, and scientific literacy in CBPR projects rooted in environmental health. An additional appendix discusses the logistical aspects of running our research group, whose faculty, postdoctoral fellows, and graduate and undergraduate students are from an array of disciplines and whose community partners are located in Massachusetts, Rhode Island, and California. Throughout this book we provide extensive quotations from our many interviews and observations. All unreferenced quotations come from these sources. This volume demonstrates that the realm of health social movements, and contested illness struggles in particular, is diverse and fluid, and there is no single ethnographic or scientific approach to engaging with this burgeoning field. The body of work discussed here suggests that just as health social movements can transform scientific knowledge production, science also shapes these social movements in unexpected ways. Indeed, communities that engage in scientific projects to advance policy change find that they must grapple with the same polemical issues and contradictions they had previously challenged. Nevertheless, we believe that contested-illness struggles can be of critical importance in democratizing and reshaping science, social policy, and regulation. Ultimately, such changes can transform the structural conditions affecting social justice, racial equality, public health, and environmental sustainability in the United States and globally. The politics and science of health and disease remain contested terrain among scientists, health practitioners, policy makers, industry, communities, and the public. Stakeholders in disputes about illnesses or conditions disagree over their fundamental causes as well as how they should be treated and prevented. This thought-provoking book crosses disciplinary boundaries by engaging with both public health policy and social science, asserting that science, activism, and policy are not separate issues and showing how the contribution of environmental factors in disease is often overlooked. Phil Brown, founder of the Contested Illnesses Research Group at Brown University, is Professor of Sociology and Environmental Studies. He is the author of No Safe Place: Toxic Waste, Leukemia, and Community Action (UC Press). Rachel Morello-Frosch is Associate Professor in the Department of Environmental Science, Policy, and Management and the School of Public Health at the University of California, Berkeley. Stephen Zavestoski is Associate Professor in the Department of Sociology and the Environmental Studies Program at the University of San Francisco.